Belle de Couture: 60's Floral. These are some outfit shots that have been sitting on my desktop since the beginning of September. I was so busy with preparing for NYFW that I had forgotten to post them! This 60's floral midi skirt was a fabulous thrift find. The zipper and tag is so old school... it truly shows how old the skirt is. 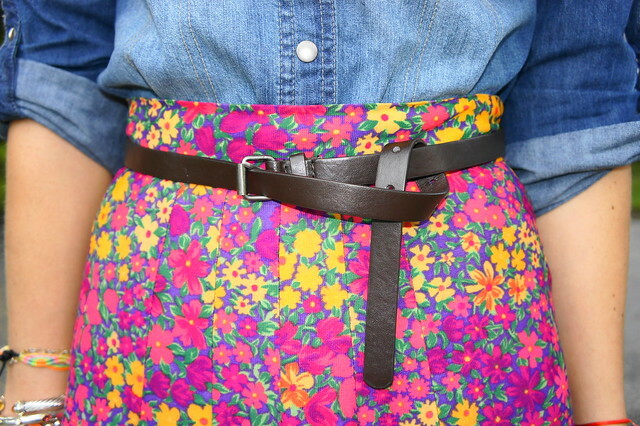 I love the vibrant colors and the floral print!! *Don't miss your chance to get your hands on a gorgeous vintage inspired necklace from Noble House Designs! Enter the giveaway HERE! Giveaway ends TONIGHT at 7:00 PM eastern time! I love this look. Great colours and so unexpected with all the mustards and reds that are around for fall. Such a beautiful look, I just love the denim with the bright florals, and those strappy sandals are perfect! Wow! The colors are so vibrant for being vintage. Nice find. I like it paired with the denim shirt! I love seeing colors during Fall..it definitely cheers you up. pretty outfit.. I love how even rain won't put you off from making a photo shoot!